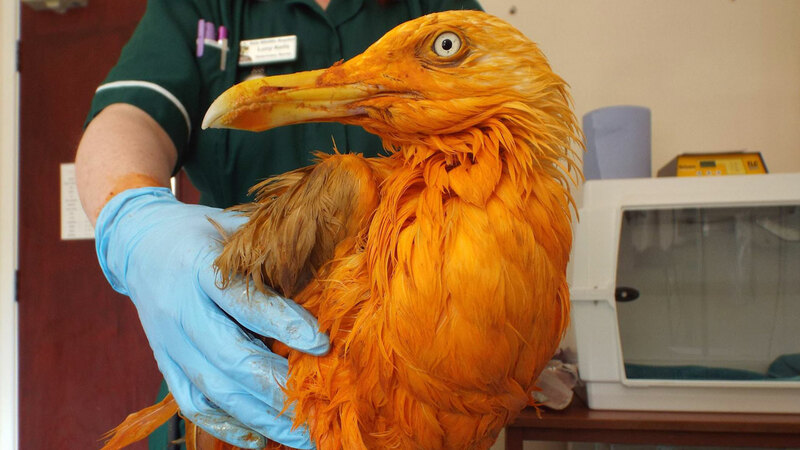 BECKFORD, England (WABC) -- Officials at a wildlife hospital say a seagull turned bright orange after falling into a vat of chicken tikka masala in Wales. The gull was likely scavenging for food when it became stuck in the thick sauce. The bird was rescued and taken to Vale Wildlife Hospital near Tewkesbury, a town about 110 miles (177 km) west of London. Staff cleaned the seagull until it returned to its original color, but said it still smelled spicy the following day. Caroline Gould, who founded the wildlife hospital, has nicknamed the gull David Dickinson, after the British TV presenter known for his tanned complexion.